Generate electricity anywhere with this 1500 watt mobile generator for normal usage or emergency standby. Rated at 115 volts, 13.1 amps. A voltmeter and two outlets are included. ** Portable electric current is generated on this rear-mounted unit. Rated at 1500 watts, two 115-120-V lines may be used and a voltage meter makes it a simple matter to set proper PTO rpm. Kill an acre of insects in 10 minutes with this Blitz Fogger attachment. * A billowing cloud of dry fog rolls over, under, around and through all insect hiding places . . . cleans out all crawling, flying pests. 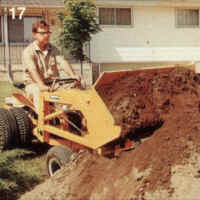 Handle many earthmoving chores with this Earthcavator attachment. 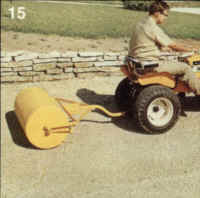 * Scraper handles cut and fill jobs on new lawns. Blade may also be rotated, without leaving the seat, and used as a backfiller. 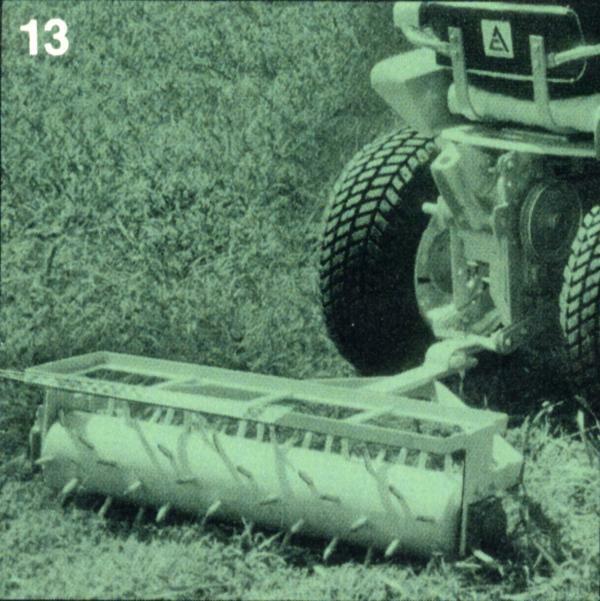 Further rotation exposes heavy duty ripping teeth for scarifying hard-packed soil. 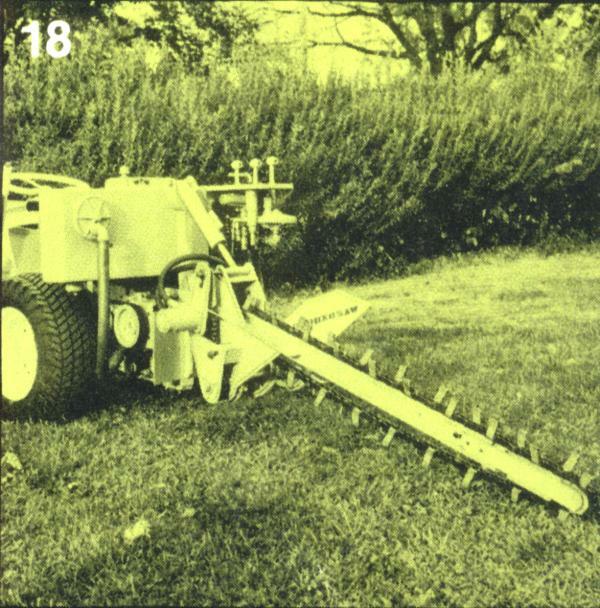 Aerate and condition your lawn with the Gill Spiker. * This 36-inch wide spiker punches 80 holes every roller revolution . 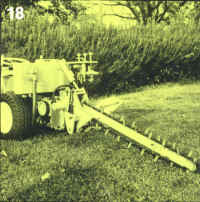 . . aerates and stimulates root growth . . . prevents surface water run-off . 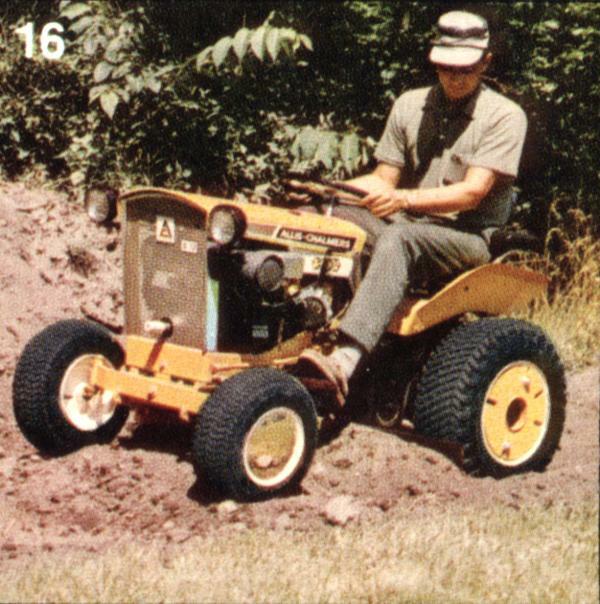 . . loosens and prepares bare spots for re-seeding. 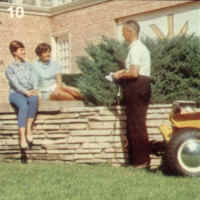 Landscape and maintain grounds with the versatile York Rake. * Removes roots, stones, debris . 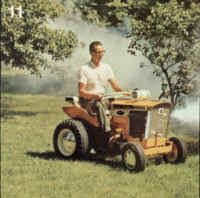 . . spreads topsoil evenly and quickly. May be used straight, or angled right or left. An optional grader blade attachment is available. 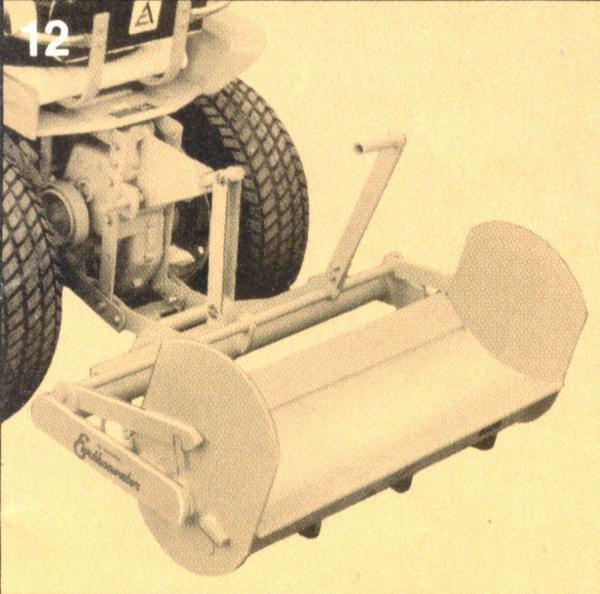 Compact new driveways, firm new seedbeds with this 36-inch wide roller. It attaches easily with just one pin, is light enough to handle and store easily, yet it weighs 431 pounds when filled with water. ** A 36" wide, 12 gauge steel roller for firming seedbeds and restoring root contact in lawns. It attaches to the tractor drawbar and can be weighted with up to 40 gallons of water. A spring-loaded scraper keeps the roller clean. Perfect contours are simple with this low cost, center-mounted grader blade which you can angle left or right. The sturdy 42-inch carbon steel blade is a half-inch thick and is reversible. ** A 42" grader blade is attached to the front axle and gauged by the front wheels. The three position blade may be used straight or angled right or left 30°. The blade is reversible for extra long wear. 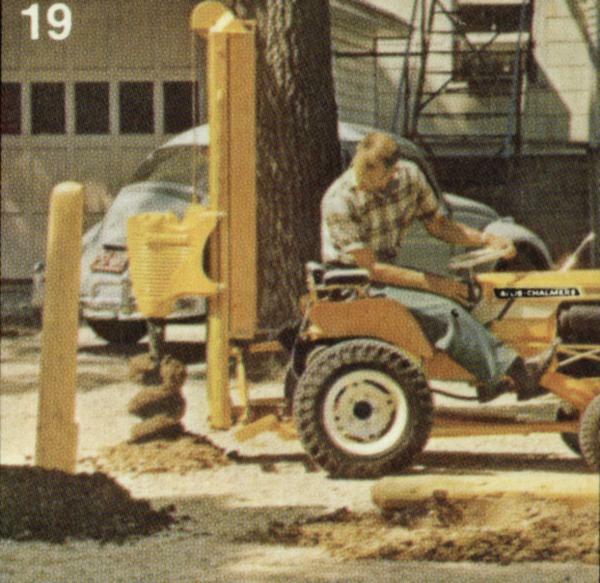 Move 300 pounds in one bite with this hydraulic loader. Dumping height of the big 42-inch bucket is 5 feet. Bucket holds 4 cubic feet. The loader frame removes quickly and easily from a sub-frame, freeing tractor to do other jobs. ** This versatile unit has 500 lbs. breakaway with capacity of 300 lbs. to a full 5-ft. height. A 42" tread width bucket is dumped by a roller latch mechanism and reset by lowering the loader lift frame. A 1/2-gallon oil reservoir supplies a pesco gear pump, creates a flow of fluid to the control valve which directs this flow to the single-acting lift cylinders. T he loader frame and complete hydraulic system are easily removed from the front PTO and loader subframe to free the tractor for other uses. 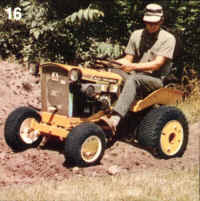 The center and rear PTO's may be used with the loader installed. Dual wheels and a counterweight box are recommended for maximum efficiency. Cut a trench quickly - even through frozen ground-with this "Groundsaw" attachment. * Carbide teeth stay sharp even in hard digging. Boom raises and lowers hydraulically. Hydrostatic drive absorbs shock loads. Choice of 2-1/2, 3 and 4-inch trench widths. Dig holes fast with this earth auger attachment. Saves time and effort for setting fence posts, planting trees, putting up rural mailboxes . . . many other chores. Hole diameter range from 4 to 14 inches. Digs to a depth of 48 inches. ** A new post hole digger is now available. Auger sizes from 4" to 14" up to 48" depth. The hydraulic system and auger are driven from the front PTO. The pump is belt driven. The auger is driven by a shaft and belt drive and engaged by a PTO clutch. 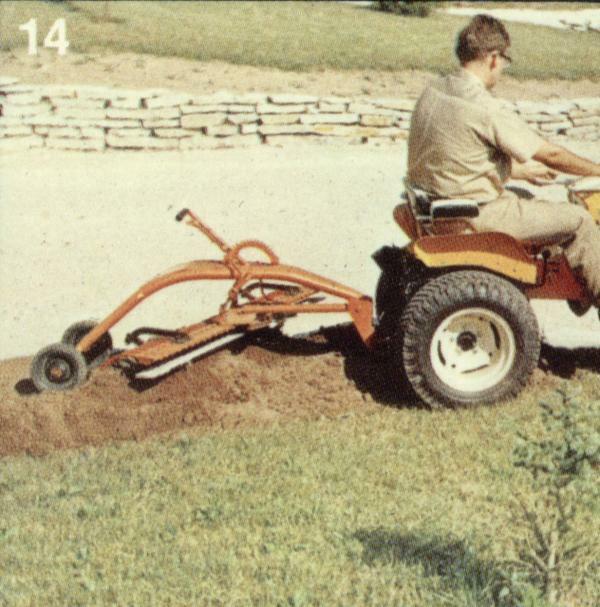 The auger mast is adjustable for leveling fore and aft and side-to-side by two turn buckles. A counterweight box is standard equipment. Plain or serrated augers are available. *This equipment is not built by Allis-Chalmers, but it has been tested and approved for use with Allis-Chalmers tractors.